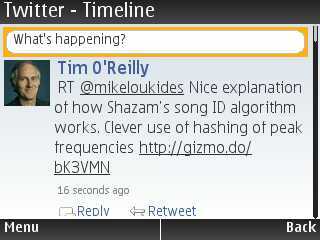 There are few decent native twitter client for smart phones with symbian OS. For me, Trill is one of the few. 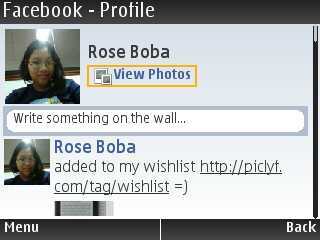 I downloaded and installed it to my Nokia E71 phone, and it’s cute. Trill is created by Spice Labs, an India-based development team. You can download it from the Nokia Ovi Store. 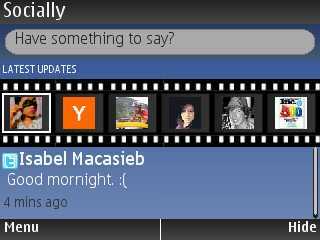 Here are some screenshots I took from my nokia E series celphone. If I’m bored, I usually browse the Nokia Ovi Store from my Symbian Nokia E63, then download whatever applications I find interesting. Anyway, since I’m from Cebu, Philippines, naturally, I got interested when I found my local newspaper, Sun.Star, has a downloadable application in Ovi Store. 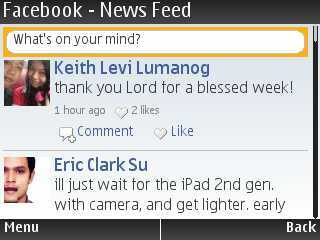 When I played with it, I realized it’s not really a S60 native client, but it’s more of just a widget, a shortcut link. So when you click on the widget from you mobile phone, you will be then redirected to the mobile web version of Sun.Star. So it’s just like viewing from your mobile browser. But nevertheless, I am happy to see my local newspaper in the Ovi Store. Following are screenshots from my mobile phone of Sun.Star. 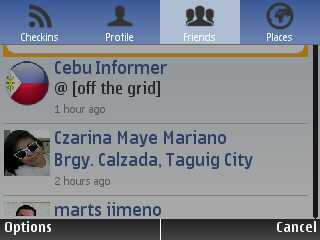 I randomly found Inquirer, Philippine Daily Inquirer, from the Nokia Ovi Store. Of course, the curious me, I downloaded it to check it out. It’s a so-so native symbian application. I guess my reaction is like that because I’m not really fond of reading newspaper online, how much more from my Nokia E63. I mean, for me, reading newspaper is always tangible paper for me. Anyhoo, following are screenshots I took of the native application of Philippine Daily Inquirer from my S60 Nokia E63 mobile phone. The texts are quite big, but the format is kind of annoying to look at — not my idea of pleasure reading. If you’re a fan of Last.fm or any online music streaming or even if not, then Mobbler symbian application is just something you need to download to your Symbian mobile phone. It’s a full-featured native client, and works perfectly smooth on my Nokia E63. You can stream music from it. You can start a new station for your Last.fm straight from your Symbian phone. And, it has different tools which you can play on — sleep timer, alarm, etc. You can like or not a music track. If you have friends or groups, you can read shout-outs from other users. After all, it was a hobby application that I was giving away for ‘free as in beer’; why not give it away so that it’s ‘free as in speech’ too? Since it was something I mainly wanted for personal use, I wasn’t interested in making money off it either. You can download Mobbler app straight from your mobile phone via Nokia Ovi Store. Or, you can check more information and download Mobbler from here http://code.google.com/p/mobbler/. Then, join me in the Mobbler Users group in Last.fm. List of compatible mobile phones. Check here for more of the list. I’ve been looking for dropbox or dropbox-like application to be available to my Symbian (S60) Nokia E63 mobile phone. Call me lazy but I hate plugging in cables to my phone to my computer just to transfer files. So most of the time I use bluetooth to transfer files from my mobile phone to laptop. 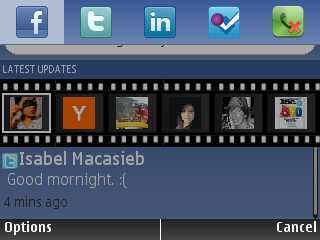 But I could not find a more efficient way of transferring images from my Symbian E63 phone to the web. Of course, I can email the images but I hate dumping them all in my email. Though, emailing them to my picasaweb account is a better way. But it feels comforting that you have this application in your mobile phone to where you can easily dump your files to be uploaded to the web. The feature that I really want to use in 4SHARED is that I can upload my images taken by my phone camera by batch (folder) so it’s faster and more efficient than doing it one by one. You can then access all your files uploaded to 4shared via web when in your computer / laptop by simply going to 4shared.com. It just looks like exactly from my mobile phone too. Then, another nifty feature of 4SHARED is that you can search for any files from your mobile phone — this gets handy when you are bored or if you need something. You can search for music and videos, then you have instant entertainment straight from your Symbian mobile phone. So yes, I’m now fine without dropbox in my Nokia E63 since I have 4shared. 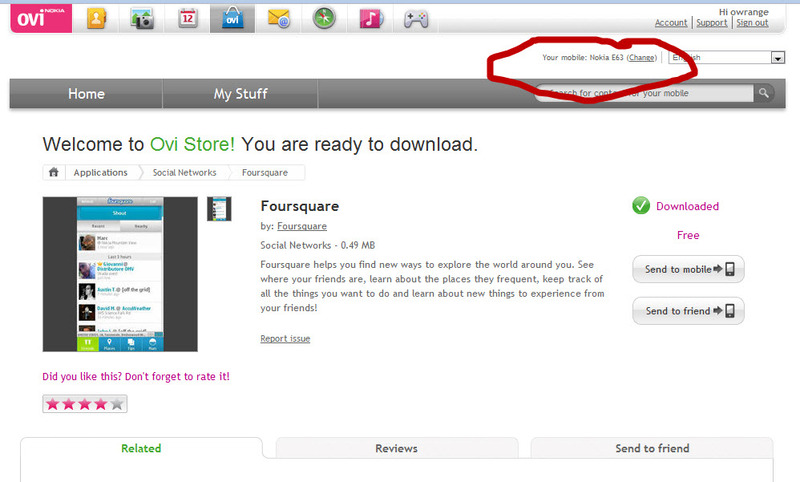 You can download it from your mobile phone here http://store.ovi.com/content/34397. Or, you can click on the following affiliate link so you can get started with 4shared. 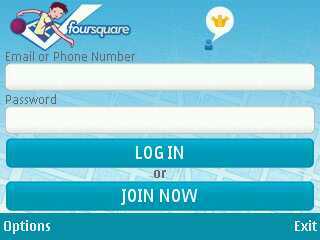 Then, let’s be friends in 4shared, add me to your contacts here http://www.4shared.com/u/xUQ2NyHj/owrange.html. 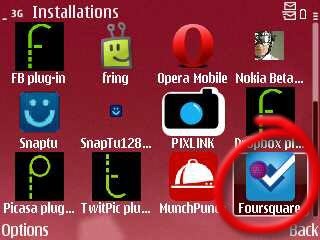 As I posted in my previous post, Foursquare can now be downloaded from Nokia Ovi Store. 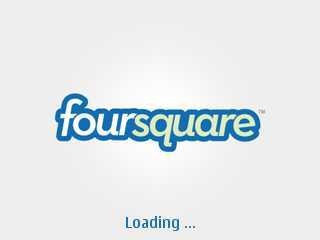 I was super excited — I’m closet fan of Foursquare. 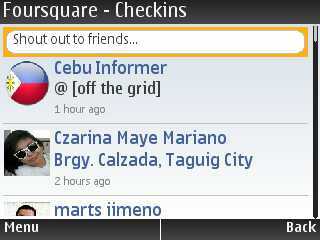 Following are the quick screenshots of foursquare from my battered Nokia E71. I tried downloading it from my Nokia E63, but it did not work. The download button in the Nokia Ovi Store just froze. 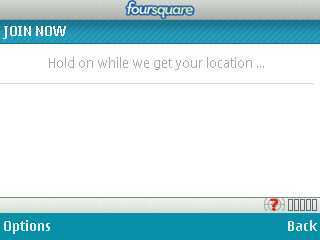 But I checked the Ovi Store via web, and it says that Foursquare is available for Nokia E63. So I don’t lose hope yet for my Nokia E63. For more screenshots, you can check the Nokia Ovi Blog. Folllowing is a video of Foursquare on Nokia N8, taken from the Nokia Blog too. 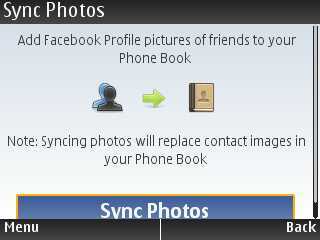 Sync Photos (NEW) — photos of your phone book contacts are automatically synced with profile photos from social networks. Desktop Alerts — latest updates from your networks automatically pop-up on your phone desktop. Socially app is created by Antarix founded by Nagesh Rao. I’m a Gravity fan, but I find Socially likable. I guess more polishing, and it could be at par with Gravity. I was able to download it to my Nokia E63, and played it with for awhile. I haven’t really tweaked it much. 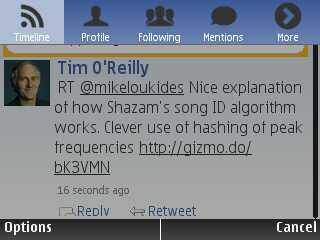 Following are screenshots from the first few moments I used Socially, native client that integrates twitter, facebook, linkedin, foursquare for Nokia Symbian mobile phones. 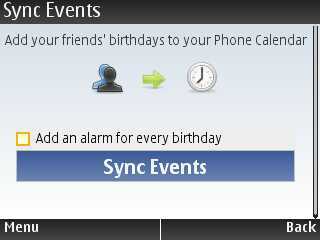 The Socially app’s sync features of birthdays and images from facebook to your Nokia’s phonebook is kind of similar to iPhone and Android. You can find a complete list of Socially’s features from here. There are more features you can check. To download straight from your mobile phone, go to http://m.sociallyapp.com/dnld/. (Edited to add this.) I noticed that if you have new updates, and you already leave (open) the Socially app, a sort-of bubble will pop up in the front screen. Cute, huh.